Our plan to divest Ragnaros of all his worldly goods finally came to fruition tonight in a climactic battle between the forces of us (40 potioned-up raiders spoiling for a fight) and them (Ragnaros and his assorted minions). 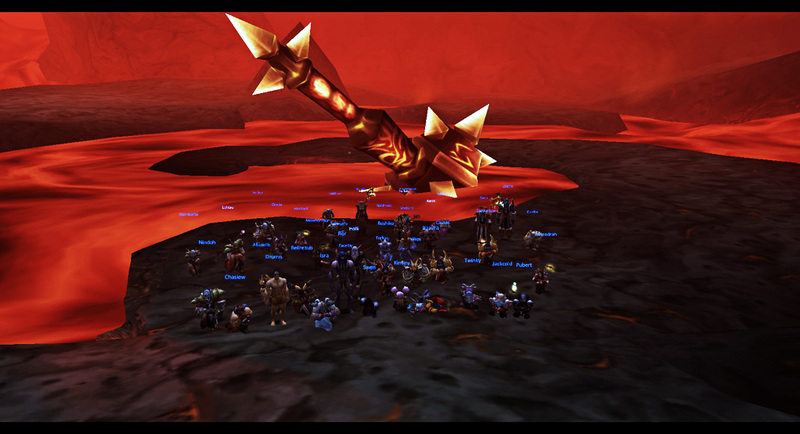 It was a fast, clean fight; a few inevitable deaths, of course, but we had Rags down to 39% when the sons spawned, we survived the sons, and buckled down to exact revenge for the untimely demise of poor Majordomo Executus. Okay, yes, it’s not like he was a close friend – but we’ll take any excuse. Six hours of Molten Core, from our zone-opening last night to Rags’ final blows tonight, and the Firelord was well and truly depantsed. The depantsing continued, literally, when we opened him up for loot – congratulations to Holli on her Legplates of Wrath and Ushaia on the Leggings of Transcendence. Pubert got his long-awaited Cloak of the Shrouded Mists, while Sayyuntow scored a Spinal Reaper Rags just had lying around. Congrats and thanks to all the raid group; we’ve made great progress in MC in the last couple of months. Ten weeks from our first tentative trash-clearing with 20 raiders, to a six-hour complete clear of the zone. Now onwards and upwards to Blackwing Lair!